Man, it has been so nice to get back in to the swing of things and have some bright sunshiny weather. I almost don't know what to do with myself. Krista of Krista Kooks has made a bunch of Rachael Ray recipes recently: Brazilian Chicken Cutlets with Raw Tropical Sauce, Chicken Parm Bites, Tilapia with Balsamic Brown Butter, and Creamy Farfalle with Bacon, Tomato, and Peas. Lisa of Simply Things Family made Cacio e Pepe (cheese and pepper pasta) and Spinach with White Beans. Reporter Jeff Houck admitted that he was wrong about Rachael Ray. 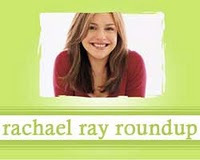 Bee Balm Gal tells us that Rachael Ray did her annual trip back to her high school this week for a fundraiser. According to Al Dente, Rachael Ray is featured in food journalist Kim Severson's new book called Spoon Fed, How Eight Cooks Saved My Life . Rachael Ray attended a Food Bank fundraiser and offered some ideas. Deborah of Taste and Tell celebrated Rachael Ray Saturday with Honey Rosemary Chicken and Rice Pilaf. Sue of Important Wordy Bits tried Rachael Ray's Mini Cheeseburger Salad. Kim's Concoctions features a review of Italian Roast Chicken with Orange and Oregano.